Hey guys! I've been wearing so much glitter lately that I keep finding stray glitter all over my house lol. First up this week is Jasmine. 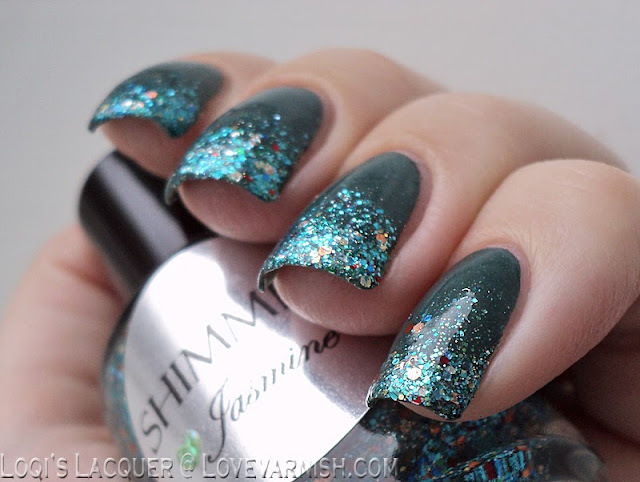 Jasmine is a gorgeous sea-green glittermix with a clear base. 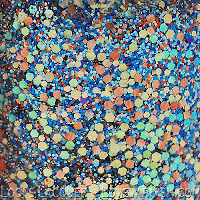 Mixed with the sea-green are red, gold, orange, blue, silver and green glitters. 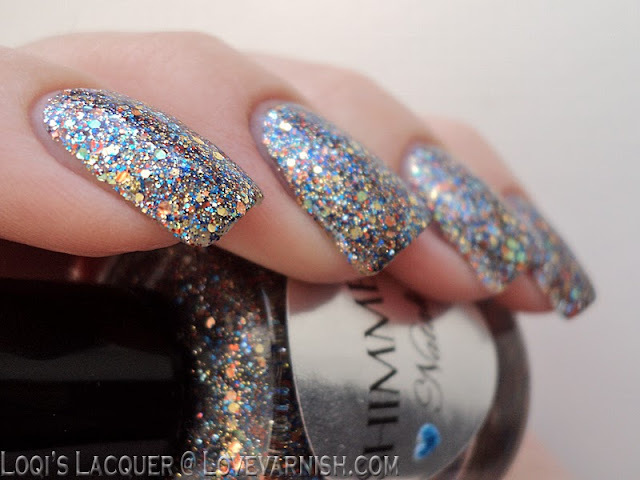 As with all Shimmer polishes the glitter has different shapes and sizes. 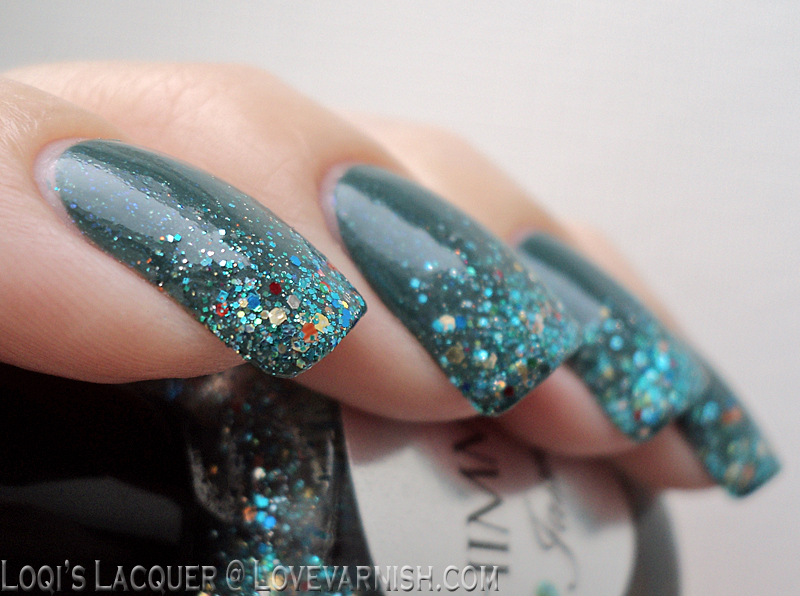 For this manicure I used Jasmine over Catrice Petrolpolitan. The little green and blue flecks in Petrolpolitan made this the ideal base for a gradient I think. 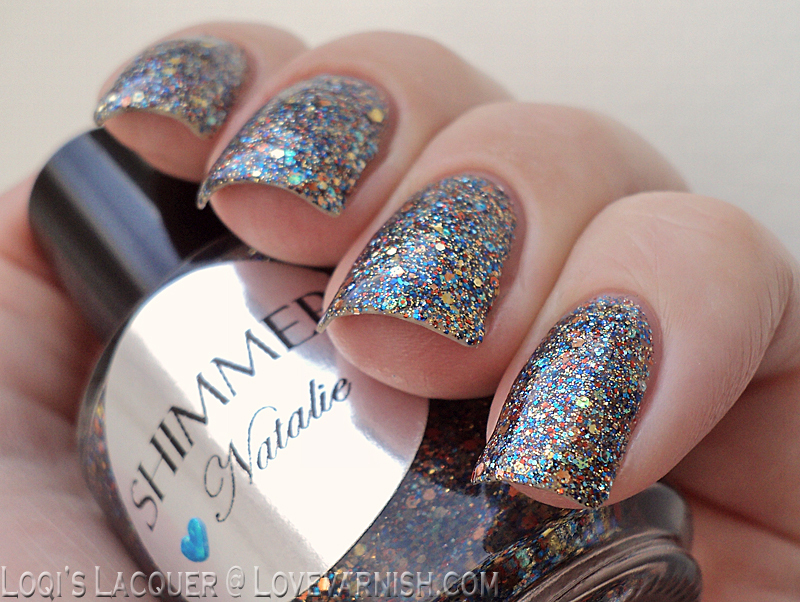 Next up is one of my favourites of the Shimmer polishes I showed you: Natalie. 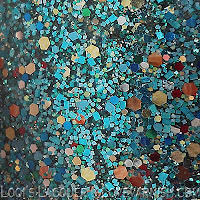 Natalie is a gorgeous mix of blue and copper/gold. As you can see, the size difference between the blue and the copper/gold is very prominent, and I really like the effect this gives. 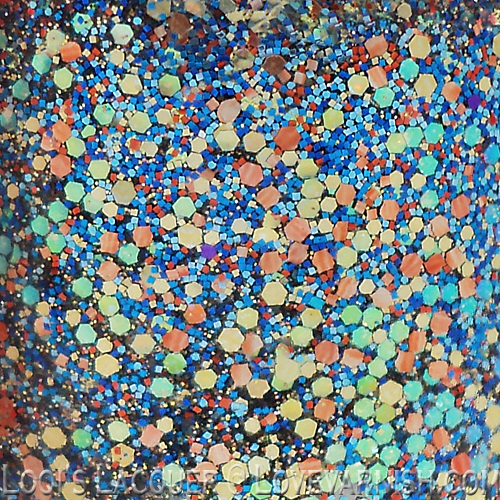 Next to that there are also tiny red and orange glitters, giving this mix extra depth. I am wearing 3 coats of Natalie here, no base colour. So even though Natalie's base is clear, it's still opaque enough to wear on its own. I did have some trouble with getting the larger glitter out. 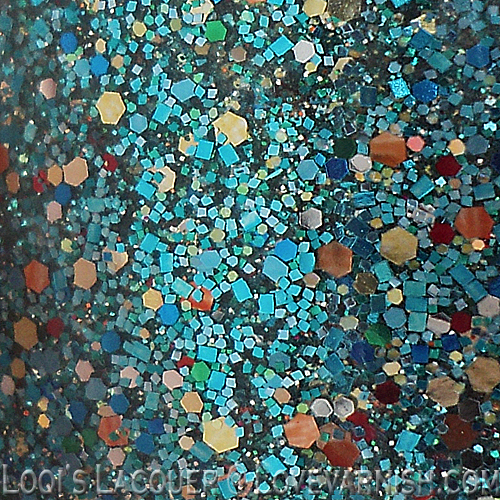 As you can see from the bottle shot to the right, a lot of the copper/gold glitters are clinging to the sides. But I love the end result on the nail none the less. 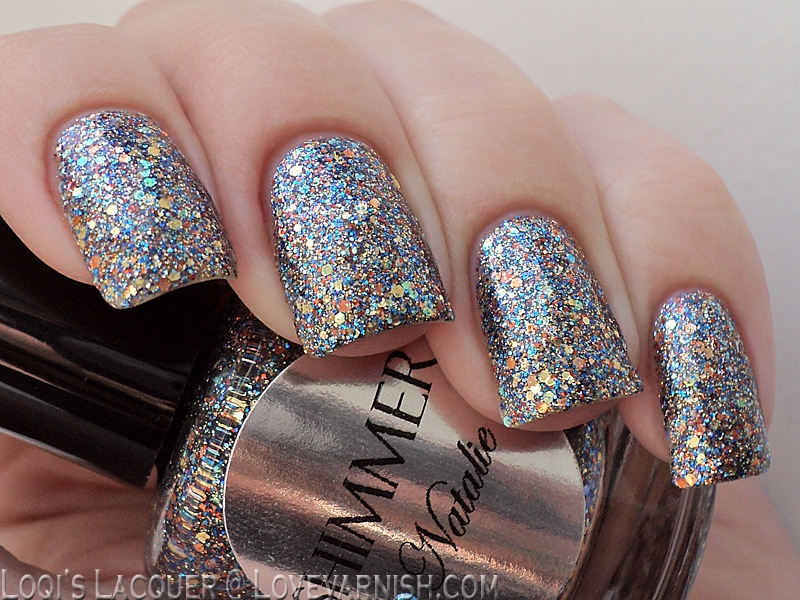 Soooo, when I started this Shimmer polish swatchathon I had 11 polishes to show you. Well those 11 are done now, but Shimmer was so kind to send Deborah and me more samples to show you! Isn't that nice? I love these polishes a lot, so I am over the moon! I hope you guys like this post, and see you soon! Jasmine is one of my favorites of the one I own :) Your swatches show the glitters perfectly! Love love love. I am obsessed with Shimmer polishes! I love the gradient. So pretty. oooh that reminds me! 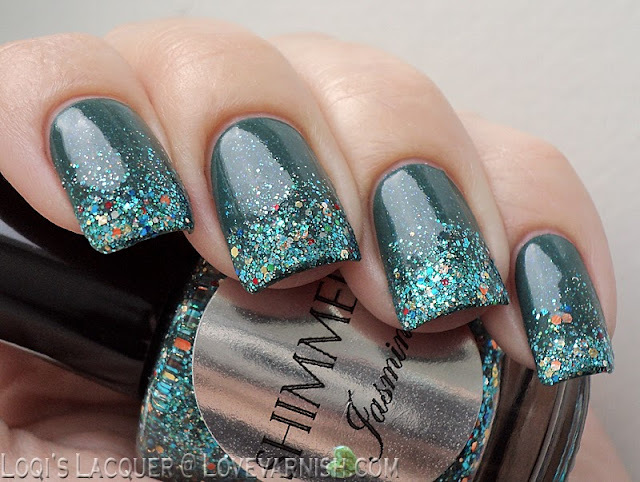 I still have to get my Zoya namepolish, thanks!